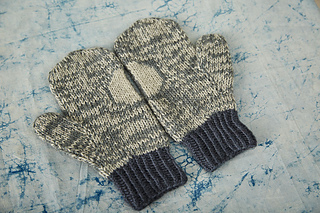 Gauge: 18 sts & 24 rows = 10 cm / 4” over stocking stitch on 4.5 mm needles with yarns B and C held together after blocking. Always use a needle size that will result in the correct gauge before blocking. 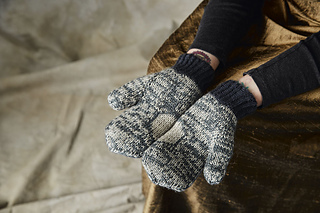 Notes: The mittens are knit in the round from the bottom up with the thumb stitches held and picked up at the end. 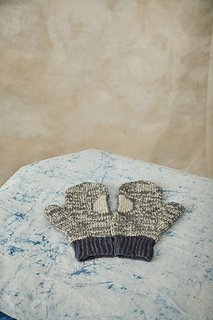 The cuff is worked in rib stitch before changing to stocking stitch for the hand. The hand is worked using one strand of yarn B and one strand of yarn C held double. 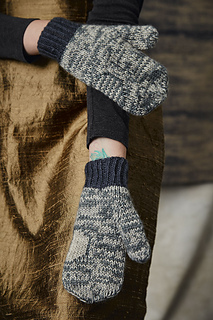 This allows the moon motif in the centre of the palm to be worked in Fair Isle. When working the moon motif, hold yarn B or yarn C single as indicated in the chart with the unused yarn floating behind it. 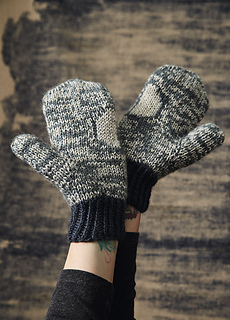 The pattern for the left and right mitten varies when working the thumb gusset and the moon motif, but the remainder of the pattern is alike for both hands.